We attended a most excellent Chanukah party tonight. It had it all: fun folks to talk with, delicious latkes, a huge variety of deserts, whip cream(!) and yes, a rousing game of spin-the-dreidel. 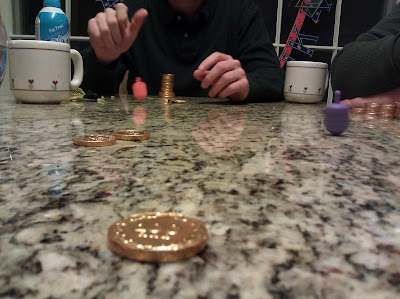 We left before a true winner could be declared, but I was hanging in there with a few chocolate coins left to my name. It really was tons of fun. So go ahead, bust out a dreidel, grab some M&M's or other gambling material, and play away. 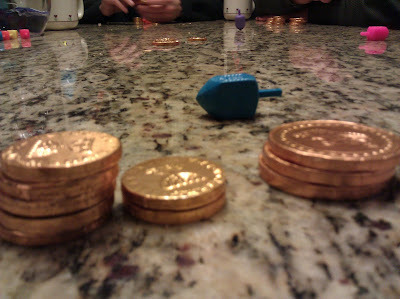 If nothing else, it's a great way to teach kids the joys and sorrow of gambling.